Fleas at 6pm Saturday, Feb. 25! Well, this should be fun! Live music ALL weekend long. Not to mention food and drink. This is a great way to survive winter, even if it hasn't been much of one. Check out http://www.facebook.com/events/242205592513034/ for the schedule of performers. 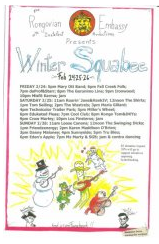 Jamming every evening after the main acts, and there even may be some contra dancing! Music starts at 5pm on Friday, 11am on Saturday and Sunday.